Wireless internet certainly sounds useful, but when it comes down to taking advantage of it, certain difficulties arise. Even if, unlike me, you have a laptop with batteries that actually the work, there’s the matter of all those plugged in peripherals you’ve come to rely on. Take your laptop to another room, and suddenly you’re bereft of printer, scanner, external hard drive and a miscellaneous ‘more’- unless of course you wheel the whole setup around on some kind of trolley. Maybe I’ll just stay at my familiar computer desk for now. Bakumatsu Kikansetsu Irohanihoheto 12: Whilst Akidzuki falls into flashback and despair over the loss of Ryouma, the troupe opens their new play in which everyone has the challenging role of playing themselves. Despite the ease with which the Lord’s Head and its effects can now be defeated, this is another solid episode which leaves me with a need for more (even if the series does change direction in its second half). Busou Renkin 19: Why is it that every episode of Busou Renkin must attempt to top the last in terms of crudeness? After traumatising us with the continuing battle between naked Ikusabe and body-suited Papillon, the series jumps to an assault on Victor and a battle between Gouta and Negoro in which Tokiko stands around like the useless cheerleader she has become. The introduction of new characters on both sides has also led to irritating plot holes with regards to their tactics and abilities, one of which will be ranted about in the extra section below. Extra: Negoro’s ‘byway’ only accepts his DNA to prevent foreign objects from entering, but a muffler with his hair sewn in and Gouta’s chakra (covered in Negoro’s blood) are both able to enter by virtue of being in contact with his DNA. If that is the case, why wouldn’t anything that was in contact with his DNA (the surrounding DNA, Gouta when he was holding onto Negoro) also be accepted? After all, if only the DNA itself was accepted, only the hair in the muffler or the blood coating of the chakra should have been accepted, whilst the non-Negoro parts would be rejected from the byway. Yes, I know it’s dangerous to analyse SJ too closely, but this deserved a mention. Le Chevalier d’Eon 14: The England arc continues in this episode, which sees Guercy and the Musketeers enact a plan to look at the contents of Robert Wood’s trousers briefcase by inviting him to a dinner party. With that one objective being the prime focus of the episode, this isn’t really Chevalier’s finest hour, but it is still a solid instalment that sets the stage for the more exciting events to follow. Death Note 17: I’ve finally put Death Note on red, simply because I can’t keep fooling myself each week that whilst I didn’t enjoy the current part of the story in anime form, the next one will be worth the wait. 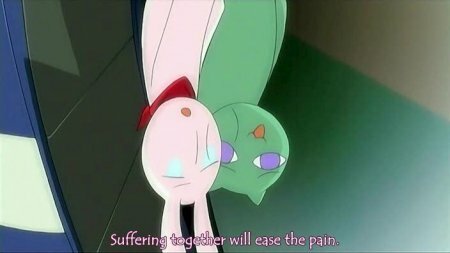 So far, I can’t bring myself to drop the series when I want to see Near animated, but I’m finding it more of a struggle to drag myself through each episode when the anime isn’t bringing anything new to my experience of the franchise. Deltora Quest 2: As Deltora Quest forges ahead into its second episode, the only real question to be asked it whether the series more closely resembles a classical RPG or an S-RPG. This episode sees obligatory female Jasmine and her pet mascots join the party so that our bold heroes can beat the first dungeon in spite of their lack of EXP; as with the first instalment, its strength is in its utter predictability and unintentional hilarity. Kanon 19: With all the lesser girls out of the way, the time has come for Yuuichi to turn his attention to Ayu (and to a lesser extent Nayuki) in what must be the final arc of the series. Despite my interest in seeing more of Nayuki, such a fleeting desire cannot save the series for me now, and so the setup for Ayu’s ‘big reveal’ is just as dull as pretty much everything that has preceded it. You may even wonder why I continue to watch the series, but in essence it is only a combination of a desire for completion and a need to write the Harem Diaries. Maria-sama ga Miteru OVA 2: Why must this OVA insist on making fifty minute episodes when thirty minute ones could tell the same story without sending me to sleep? This instalment sees Yumi and the others resolve to help Sachiko overcome her hatred of men by having a ‘meet and greet’ with the student council of the Hanadera boys’ school; unfortunately, not only does it take an incredibly long time in getting there, but the boys are all shallow personalities- even gender-confused Alice is rather arbitrarily introduced for a character with lifelong issues over his sexuality. Red Garden 16: Just for a change, this week sees everyone angsting over their nearest and dearest- Claire has an argument with her father after her brother is hit by a car, Rachel breaks up with Luke, Rose visits her father to update him on the family situation and Kate finally discovers that Hervé is evil. In between the melancholy and laughably over the top crying and shouting, we finally learn a bit more about what’s going on- in an ROD/Madlax-esque turn of events, both sides are apparently fighting in order to gain control over two Cursed Tomes. Coupled with this rather disappointing revelation is a fight scene between supporting characters (even the school’s headmistress gets in on the act) which raises yet more questions as to why everyone in this series seems to have special X/Matrix powers, and whether anyone ever cared about the now deceased JC (I didn’t even know he had a name, let alone that he was meant to be Lula’s brother). The end result is an increasingly ridiculous plot and far more questions that will most likely never be satisfactorily answered. 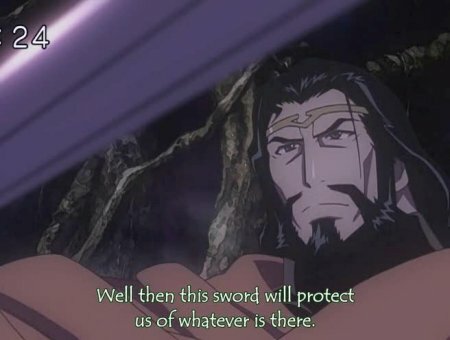 Romance of the Three Kingdoms 41: As anyone who has watched the show to this point will be well aware, Shu is a heroic kingdom of justice and righteousness, and naturally, petty and small Wu cannot hope to compare. Mired in jealousy over the relative size of their ‘weapons’, Zhou Yu decides to set a trap for Zhuge Liang and Liu Bei- can our heroes outwit his plans? If you answered ‘no’ to that question, go to the back of the class. Shounen Onmyouji 12: It took far too many episodes, and I had almost despaired of it happening at all, but at long last, the final confrontation with Kyuuki is here, complete with brief flashes of screen time for the little-used Tenitsu and Genbu. Despite the obvious questions of “where exactly will the plot go from here?” and “what is the plot anyway?”, this is an enjoyable enough episode, much improved by the fact that Kyuuki’s arc is finally over. 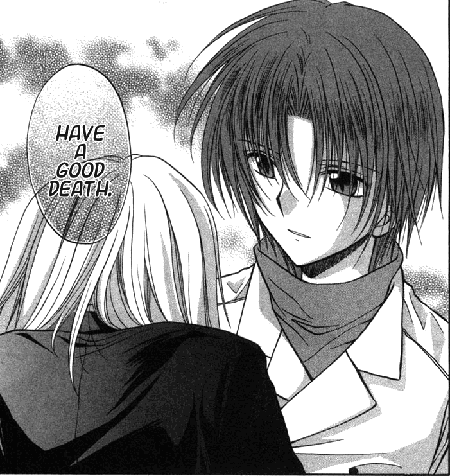 Higurashi no Naku Koro ni Onikakushi 4: It’s back to the creepy first arc in this chapter, with Keiichi discovering that his group of friends aren’t all they seem in the aftermath of Tomitake and Takano’s disappearance. In the wake of all the came after, it’s been easy to forget that Higurashi was once a compelling and chilling tale of horror, but this chapter alone is enough to reawaken those memories and reinvigorate my interest in the series. Shakugan no Shana 8: Given the lack of releases for this mediocre manga, I had all but dropped it, but at the eleventh hour, the first chapter of volume two has appeared. Shana has now settled down in school and terrified all the teachers- but will the gym teacher fight back by setting endless running? Even this brief section of the anime cannot be wrapped up in one chapter, so come back next time to find out the thrilling conclusion to Shana’s PE lesson. Spiral 25-6: After wrapping up the game between Eyes and Ryoko in chapter twenty-five, twenty-six opens volume six with a new arc that sees Kanone arrive in Japan as part of his quest to hunt the Blade Children. As always, I have little else to add except praise for this excellent series (I’ll deal with the decline in later volumes when I get to them, for now I’m pretending that doesn’t happen), and hope for the swift appearance of further chapters. xxxHOLiC vol. 10 chapter 1: Yes, I’ve finally got around to starting volume ten, with this brief chapter that sees Yuuko relax on a summer’s day (with Watanuki manning the sprinklers) before a catgirl arrives and takes him to collect some water. Presumably the water is the same liquid that is sent to X-Tokyo in Tsubasa, but aside from noting this and revelling in xxxHOLiC’s distinctive artwork, there isn’t much to say about this brief chapter. This entry was posted in Weekly Round-Up and tagged Busou Renkin, Chevalier, Death Note, Deltora Quest, Higurashi, Iroha, Kanon, MariMite, Red Garden, ROTK, Shana, Shounen Onmyouji, Spiral, xxxHOLiC. Bookmark the permalink. 1. Toei version was so long ago, so it’s like watching a new show. 2. KyoAni’s work is making the show nice. 3. Same as you, finish what has been started. Well, the series should finish soon, (it’s 26 ep, ne?) so things shouldn’t be too bad. Say, where do you read XXXholic from? (Out of curiousity) and did you read the original Deltora Quest story books? Yep, Busou Renkin is 26 episodes (the manga was cancelled after ten volumes so it can’t go on indefinitely like some other well-known SJ series)- if it was longer I would have probably dropped it early on. I’ve been reading the Be With You Scans version of xxxHOLiC; other groups are ahead but are translating the magazine chapters which are numbered differently. I’ll probably switch when I can be bothered to work out which chapters I need to download. The Deltora Quest anime is my first experience with the franchise so I don’t really know anything about it beyond the two episodes I’ve watched.